CryoSat-2 seeks to determine the freeboard of floating ice. The primary instrument is a synthetic aperture interferometric X-band radar altimeter. Precise altimetry alone has been found not to give accurate ice thickness -- hence the other 31 companion files (such as ice density) in the netCDF under discussion. Note the radar reflection horizon is not necessarily the top surface of the ice nor the top surface of the snow. Locally, there may have been extruded or deposited brine salinity, snow on refrozen rain on snow, or snow melt in the dead of winter from advected semi-tropical moisture and abnormal temperatures. Whatever, it adds to the mass afloat, though snow (granulated ice) lacks other mechanical, thermal, dynamical and volumetric properties of ice. We are not after freeboard per se but a more nuanced understanding of the heterogeneously distributed composite out there. The question here is where does this netCDF file get its snow depth, snow depth uncertainty, snow density, snow density uncertainty from and how good are they. It is a near-real time winter product under active development, not a static journal article. source_auxdata_snow = "Warren, S.G., Rigor, I.G., Untersteiner, N., Radionov, V.F., Bryazgin, N.N., Aleksandrov, Y.I., and Colony, R.. Snow depth on Arctic sea ice. Journal of Climate, 12, 1814-1829, 1999"
In case you wondered like me why Cryosat-2 does not seem to be used to estimate Antarctic Sea Ice thickness, the following new (discussion) paper is of interest. Kwok, R. and Kacimi, S.: Three years of sea ice freeboard, snow depth, and ice thickness of the Weddell Sea from Operation IceBridge and CryoSat-2, The Cryosphere Discuss., https://doi.org/10.5194/tc-2018-98, in review, 2018. We examine the variability of sea ice freeboard, snow depth, and ice thickness in three years (2011, 2014, and 2016) of repeat surveys of an IceBridge (OIB) transect across the Weddell Sea. Averaged over this transect, ice thickness ranges from 2.4 ± 1.07 (2011) to 2.60 ± 1.15 m (2014), and snow depth from 30.0 ± 8.51 (2016) to 43.6 ± 10.2 cm (2014); suggesting a highly variable but broadly thicker ice cover compared to that inferred from drilling and ship-based measurements. Spatially, snow depth and ice thickness are higher in the more deformed ice of the western Weddell. Radar freeboards (uncompensated for snow thickness) from CryoSat-2 (CS-2), sampled along the same transect, are consistently higher (by up to 8 cm) than those computed using OIB data. This suggests radar scattering that originates above the snow-ice interface, possibly due to salinity in the basal layer of the snow column. Consequently, sea ice thickness computed using snow depth estimates solely from differencing OIB and CS-2 freeboards (without snow radar) are therefore general higher; mean differences in sea ice thickness along a transect are up to ~ 0.6 m higher (in 2014). This analysis is relevant to the use of differences between ICESat-2 and CS-2 freeboards to estimate snow depth for ice sea thickness calculations. Our analysis also suggests that, even with these expected biases, this is an improvement over the assumption that snow depth is equal to the total freeboard, where the underestimation of thickness could be up to a meter. Importantly, better characterization of the source of these biases is critical for obtaining improved estimates and understanding limits of retrievals of Weddell Sea ice thickness from satellite altimeters. Reducing a bias from 1m to 60cm might have something to do with it. The paper is in discussion until 20th July. The discussion can be followed on the link above, so far no comments have appeared. In the same magazine another discussion paper focusing uncertainty in deriving thickness from Cryosat-2 measured free-board. Price, D., Soltanzadeh, I., and Rack, W.: Snow depth uncertainty and its implications on satellite derived Antarctic sea ice thickness, The Cryosphere Discuss., https://doi.org/10.5194/tc-2018-92, in review, 2018. Knowledge of the snow depth distribution on Antarctic sea ice is poor but is critical to obtaining sea ice thickness from satellite altimetry measurements of freeboard. We examine the usefulness of various snow products to provide snow depth information over Antarctic fast ice with a focus on a novel approach using a high-resolution numerical snow accumulation model (SnowModel). We compare this model to results from ECMWF ERA-Interim precipitation, EOS Aqua AMSR-E passive microwave snow depths and in situ measurements at the end of the sea ice growth season. The fast ice was segmented into three areas by fastening date and the onset of snow accumulation was calibrated to these dates. SnowModel falls within 0.02 m snow water equivalent (swe) of in situ measurements across the entire study area, but exhibits deviations of 0.05 m swe from these measurements in the east where large topographic features appear to have caused a positive bias in snow depth. AMSR-E provides swe values half that of SnowModel for the majority of the sea ice growth season. The coarser resolution ERA-Interim, not segmented for sea ice freeze up area reveals a mean swe value 0.01 m higher than in situ measurements. These various snow datasets and in situ information are used to infer sea ice thickness in combination with CryoSat-2 (CS-2) freeboard data. CS-2 is capable of capturing the seasonal trend of sea ice freeboard growth but thickness results are highly dependent on the assumptions involved in separating snow and ice freeboard. With various assumptions about the radar penetration into the snow cover, the sea ice thickness estimates vary by up to 2 m. However, we find the best agreement between CS-2 derived and in situ thickness when a radar penetration of 0.05-0.10 m into the snow cover is assumed. "thickness estimates vary by up to 2 m.", that is hardly trivial. The paper is in discussion until 23th July. The discussion can be followed on the link above, so far no comments have appeared. 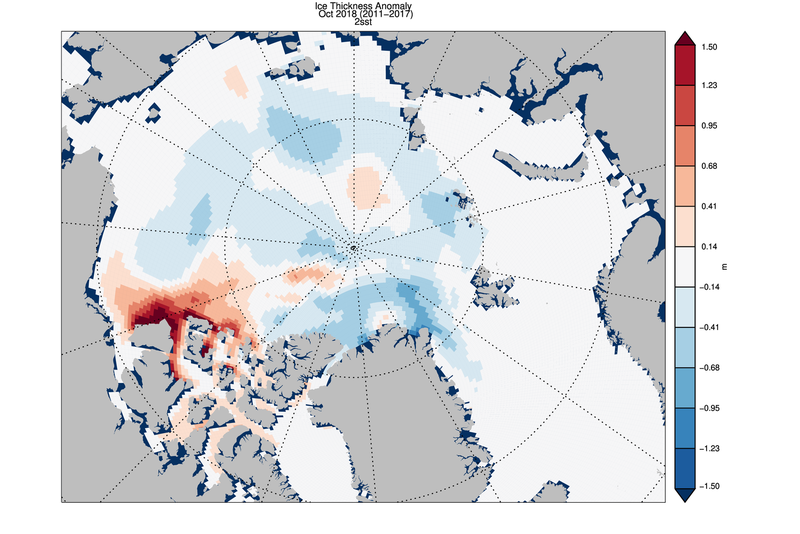 Ice thickness anomalies anomalies 2018 relative to 2011-2017 (Fig 6) show widespread negative anomalies and with thicker than normal ice only in the eastern Beaufort Sea. Thick ice in this area is to anomalous ice motion over the last 4 month that pushed sea ice against Banks Island and the western part of the Canadian Archipelago (Fig 7). This thickness anomaly pattern is supported by CryoSat thickness anomalies using the new version 2.1 from AWI. 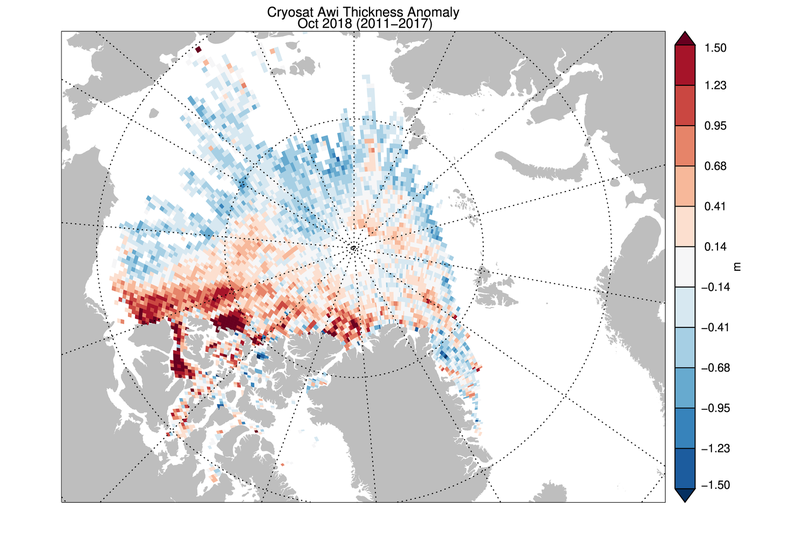 CryoSat thickness anomalies (Fig 9) are similar to PIOMAS but there are substantial differences in the Lincoln Sea and North of Fram Strait where CryoSat has positive anomalies. 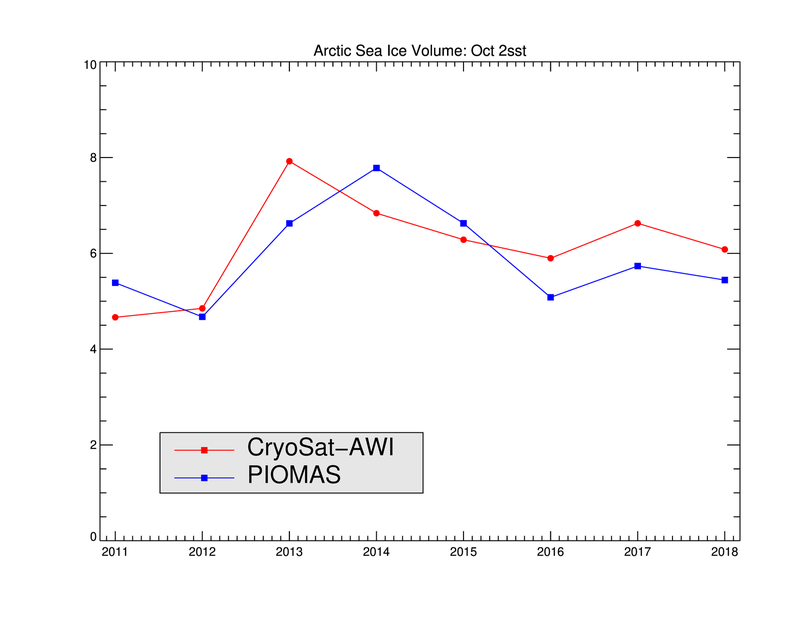 PIOMAS and CryoSat time series for October times series show little further decline in October sea ice volume since the exceptionally low values first seen in 2011 and 2012 (Figure 10). I must say the agreement is rather good in terms of the location of high and low volume anomaly areas, except in the (important) region between the pole and Greenland/CAA. Wildly uninformed speculation - but there has on and off been a large amount of open water in that area this winter. I've always wondered whether Cryosat might be prone to overestimate the average thickness of ice in fluid areas which have been subject to upheaval / repeated opening of wide polynyas followed by re-compaction of the thin ice formed on top of them during the hard winter. This might lead to a very non-uniform surface with sharp, high peaks and deep, snow-filled troughs. Conversely, PIOMAS might underestimate the volume under such circumstances if it underestimates the area of open water and the faster rate at which it freezes vs. a uniform-thickness ice sheet. Well this region has been very cold this winter, but we can only guess if this has translated into extra thickness. From Lebedev ice growth formula we know that sea ice over 2m grows very slowly no matter how cold the air is. All I know for sure is that my AMSR2 thickness is high as well, but it is definitely affected by snow. I'm HIGHLY suspicious of any model that shows large contiguous areas of ice with a thickness in excess of 3M, for exactly the reason you suggest. You can not trust these AMSR2 thickness maps. From these kind of microwave radiometer you can just derive a very uncertain proxy. For AMSR2 frequencies the penetration depth is not more than a few centimeters, therefore the signal comes just from the sea ice surface. It is rather related to snow grain sizes, layering and sea ice surface salinity.